After the daytime standard service, the Gwili Railway is running the popular Fish n’ Chip trains. Our Heritage Diesel Railcar, the Scenic Explorer will run on selected Saturday evenings in July and August with on board real-ale bar. As the train makes its away through the picturesque Carmarthenshire countryside you can enjoy traditional fish (or sausage) and chips, freshly cooked at a local Cafe and delivered directly to your train seat. 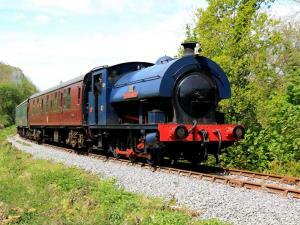 Purchase soft drinks or real ale from the on board bar and relax and enjoy an evening on the Fish n’ Ale train. The ideal end to a summer’s day exploring the delights of West Wales. Please arrive 15 minutes before departure for parking/boarding. Pre-booking advised. Book your tickets in advance and your pre-booked meal will be ready for the train time you specified. Phone the Railway to book 01267 238213. Ticket prices: Adult (16+) £16.50 - £19.50, Child £10.50 - £11.00. See website for food options.